Property 2: Dog-friendly cabin with a private hot tub, fenced yard, and a peaceful location! Property 4: Breathtaking Views! Hot Tub on Deck! Meticulously Cared For! Great Location! Property 6: Incredible Views! Beautiful Cabin! Well Appointed Decor! Hot Tub! A+ Location! Property 15: Cabin in the woods w/ private hot tub, views, paved road access - 2 dogs ok! 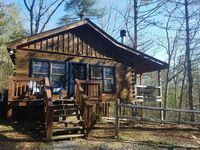 Property 17: Dog-friendly cabin w/ furnished deck, private hot tub, & paved road access! Property 24: Cozy cabin near the river features private hot tub, free WiFi, & great location! Property 28: Dog-friendly cabin with private hot tub, fenced yard, and gorgeous location! Property 29: Blue Ridge Mountain Haven- Awesome Views- Secluded Yet Only Minutes to Downtown! Property 31: Riverfront cabin w/ private hot tub, screened porch, and grill! Property 32: Two King Suites! Morning Glory! Endless View! Close to Town. All paved roads. Property 36: $150/Night Specials in Luxury Cabin that sleeps 20 and has breathtaking views! Property 38: Romantic Riverfront & Fishing! Only 5 minutes from downtown Blue Ridge! Property 39: Mountain Heaven--King-size bed, hot tub, WiFi! Property 41: Located in Cherry Log, Ga! Property 42: Lake View at it's Finest! 3 bedroom, 2 bath cabin, Hot Tub, Wifi. Property 43: Downtown:KING size bed! Huge hot tub. Close to town Elec.car charger! Property 46: Incredible Views/ Hot Tub/ Pet Friendly! Great Location! Great Value! 1) Our GPS took us straight to the cabin, downtown, hiking trails with no problem at all! 2) La Biata was so much more adorable/cozy/nice than we had imagined! 3) We were really looking forward to using the hot tub but we could just not get it to ever get anything more than a lukewarm, not sure what was up with thath. 4) This cabin really does have a beautiful view! 5) We drove an SUV and a sedan up the mountain and were perfectly fine, it was really muddy from the rain but the drive was still perfectly fine. very nice cabin and beautiful surroundings,also very relaxing and would come back again someday.